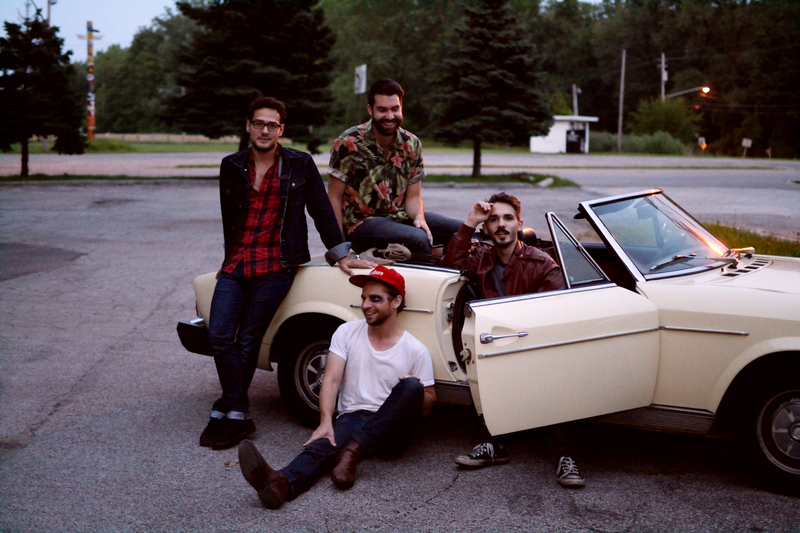 Our next fill in the blanks come from Cleveland’s own indie rock band, The Modern Electric. They’re known for their unique, ageless sound and being the masterminds of “cinematic pop.” This past summer, they traveled down to Austin to work on their new record with producer Mike McCarthy. It’s titled Original Motion Picture Soundtrack and is set to be released in early 2015. They also embarked on their first tour this past summer after much success in the local music scene. Danielle and I will be at their show with The Mowgli’s on the 15th so I sent over some fill in the blanks to learn more about them and their music. Be sure to check out the music video for the track “Great Expectations” below. The meaning behind our name The Modern Electric is….evocative of raw power and energy, and also a reference to the T.Rex album entitled Electric Warrior. We met each other….at Willoughby South High School in 2005 because we were all known around the school as blues/classic rock players. The blues are still inside us somewhere, but it doesn’t really show itself in the music we are making today. The pickiest eater in the band is….Garrett because he will only eat American food. He considers anything spicy un-American. The most OCD member is….Matthew. He is also claustrophobic, a pyro, afraid of heights, and will only listen to OLD Green Day. For fun we like to….watch entire filmographies of amazing directors like Woody Allen, Stanley Kubrick, We Anderson, and the Coen Brothers. We’re currently listening to….a lot of Lou Reed, Ryan Adams (because he is coming to Cleveland), and Spoon because their new album is unstoppable. The member(s) who writes most of our songs is….Garrett but he only writes the skeleton and has the other band members come in and flesh out the original vision of the song to its fullest potential. We find inspiration from….the power of cinema. Movies like The Graduate, Pretty In Pink, and Annie Hall are what compels us to write songs to the ones we love. Original Motion Picture Soundtrack is different from our debut full-length because….we teamed up with producer Mike McCarthy in Austin, Texas to record the new record. He produced killer Spoon albums like Gimme Fiction, Kill the Moonlight, and Ga Ga Ga Ga Ga.
One thing we want you to remember while listening to our music is….that we are all searching for the same things together – a life that’s just like in the movies. We want just as badly to win over the girl in the end, to find love, to become stars, to save the day, for our stories to have meaning outside of the suburbs we grew up in. If we play another artist’s music it’s….songs that say something to someone I love specifically that I couldn’t have said any better myself. Bob Dylan’s “I Want You” and “Queen Jane Approximately” are two examples off the top of my head. Our craziest or most memorable gig was….returning to play at summer camp talent show while in high school after winning the year before. From the moment we came out on stage the crowd was screaming like we were the Beatles. After a response like that, we knew we had something special going on. The best thing about touring and playing in other cities this summer was….finding out that we have fans all over the place. We weren’t expecting anyone to know our songs or for anyone to show up at all. To our surprise, when we played in Chicago (for example) we had a full room with a front row that knew every word. In the next six months you should expect….to hear new Modern Electric music accompanies with plenty of music videos witten and directed by the band. It is our goal to soundtrack the upcoming year for our fans. This entry was posted in Fill In The Blank, Interviews and tagged alternative, band, band interview, cinematic pop, cleveland, Cleveland Music, fill in the blanks, local artist, pop, recommended artists, The Modern Electric. Bookmark the permalink.